I was at home checking my axis q1615 mk ii outdoor weather cam footage using my laptop computer from my living room. 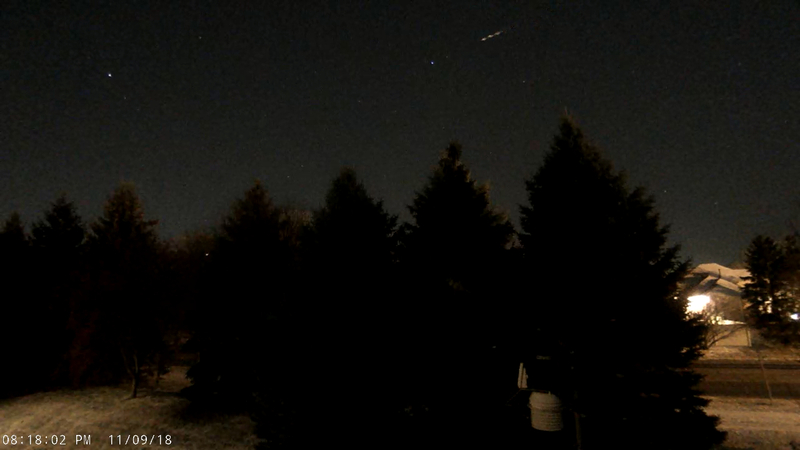 little after 8:15pm cst i noticed on recorded footage, three white lights traveling at the same speed well over a mile from my house. the 3 distinct lights seemed to merge into a fuzzy line. to fast for a plane, and too slow for a meteor. the lights seem to be heading in a straight line, but when you look closely, you can see the lights drop slightly, then straighten out. i lost site of the lights because of distance and went out of the stationary camera view. check out my video clip and you decide to what you are seeing. my reaction was a bit of curiosity. i do live near a flight path to msp airport, so i recognize lights from passenger jets when they fly nearby.